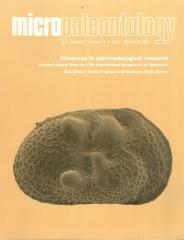 ABSTRACT: The purpose of this study is to collect micropalaeontological evidence concerning the palaeoenvironmental changes that took place at Southern Evoikos Gulf during the Holocene. Southern Evoikos Gulf is a shallow epicontinental basin, at the northern prolongation of the Cycladic Platform (Western Aegean Sea, Greece). The study area of the present research is located at the northern part of this gulf. Two cores, DEH 1 and DEH 5, the sedimentary record of which covers the last 13910 cal. yr B.P., were recovered from 70m and 75.5m water depth respectively and a detailed quantitative and qualitative ostracod analysis is performed in 88 samples of DEH 5 and 56 samples of DEH1. Atotal of 45 ostracod species were identified from DEH1 and 52 species from DEH5. The distribution of ostracod assemblages in the investigated cores indicates that a restricted shallow oligohaline lagoon was formed sometime before 13540 cal yr BP at the northern basin of the Southern Evoikos Gulf. This closed lagoon existed in the area until 11065 cal yr BP. Subsequently, during the Holocene, an unrestricted communication with the sea was established and a marine coastal environment was formed, with a gradual transition (the beginning of which is estimated at about 8000 cal yr BP in DEH 1) from an infralittoral to a circalittoral one.